Since it was clear from the title that Nagi Ryou's newest collection would be a archive of website illustrations, I wasn't expecting much in terms of quality or large illustrations. And no doubt having such moderate expectations about BEGINNING S.E.C Website Illustration Archive helped me to appreciate it more, since it turned out to be better than expected. I don't know what it is about trading card game illustrations, but I've really never been interested in them. So knowing ahead of time that Ar Tonelico illustrator Nagi Ryou's Comiket 78 release T.U.R.N Collection of TCG Illustrations would be exactly that, I wasn't initially committed to buying it. It didn't help that the resale price for the doujinshi on Toranoana was ￥1470, which is really quite high for a 24-page doujin considering I've bought new art books for less. With a little something old as something new, Nagi Ryou's Comiket 77 release COLORS compiles three volumes of S.E.C (Sensuous Expression Content according to the cover) doujinshi into one 32-page, full color collection of art work from the past few years. 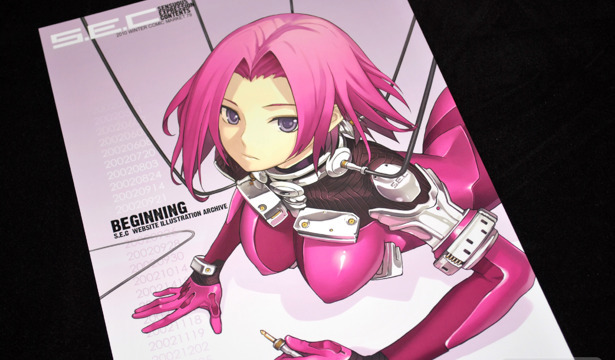 The cover art is new to the book, but the rest of the content came from S.E.C volumes 00, 01, and 03 along with a couple of postcards released at past Comic Markets.